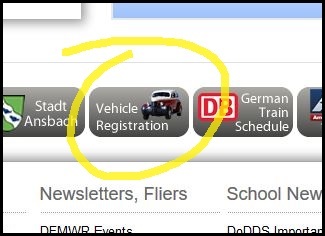 The Vehicle Registration button, found at the bottom of every page of the USAG Ansbach official website (www.ansbach.army.mil), takes surfers to the Vehicle Registration directory entry. ANSBACH, Germany (May 22, 2017) – The office for Vehicle Registration at Barton Barracks has begun an appointment system. Due to staffing issues, the number of appointments will be limited to 14 per day, allotting 30 minutes for each individual transaction. Understanding what individual transactions means is the key to this change being successful. As an example, if we take a transfer of a vehicle from one Soldier to another that is actually two transactions. The first transaction would be the transfer from Soldier A to Soldier B. The second transaction would be Soldier B applying for temporary plates for the vehicle they just purchased. During the initial roll-out phase, customers will need to report to the registration office to sign in on the appointment roster. The end goal is to have an automated system that will allow appointments to be made from home or office computers. What may seem like a simple process for the customer actually involves several documents and computer entries for the clerk, which can and does quickly add up in time to complete. Because of this, Vehicle Registration must limit each customer appointment to one transaction. To address questions or concerns, call the U.S. Army Garrison Ansbach physical security personnel at 09802-83-3863 or DSN 467-3863.